Now that Wo. has finally caught up with .No's broadcasts, thanks to a sprint in December 2016, he has to make sure to keep up. So here is his review of the January Kairos in which he shares his thoughts, ideas and notions with you. Where the opening "tune" is concerned, no answers were provided, except that we are not listening to Debussy. The familiar sound starts and morphs into an experimental pling plong, to translate the Dutch "piep, knor" expression, of piano notes. Some harmonic others definitely less so, out to shock my ears. Anna Backerra is not out to please, well at least me, with her 2nd piano sonata. Maarten van Veen does his very best, I can hear that. And there is that .No magic again. From the part-dissonant sonata I am taken effortlessly into the atmospheric sounds of Larus Sigurdsson. 'Snirt' it's called this composition. Now "snirt" has something to do with snow and dirt (Snirt) if I'm correct. So something unpleasant, I take it. And here I'm listening to the effortlessly flowing, atmospheric composition of Sigurdsson, who, again, calls forth this mystical land Iceland in his music. Like he has been doing for the past few Kairosses now. Further on in the song the dirt moves in. You will know when you listen what I mean. Like a storm sweeping the landscape. The change is abrupt. Again a piano. .No is on a piano trip for a while now. 'Flight From The City', by Jóhann Jóhansson. Again someone with a Scandinavian name and again it is the atmosphere that is all here. The piano plays a certain sequence of notes. It could be a loop even. Around it more and more strings are added, slowly building an exodus. From a single person to a host of people? I can imagine that is exactly what happens when people take freight. Now flight is also associated with aviation, but I'm of the impression that in here flight is used as in fleeing. The poem is told over the start of the piano loop. Well done, .No and voice-over. We return to Ukranian contemporary music sounding like written in the Middle Ages again. The title is 'Farewell' and as far as I'm concerned .No may take this literally for the next Kairos. Christopher Wilke is very proficient on his lute, but I have heard enough. What is nice to know, is that there is still a market for this sort of music. It's being made and it's released for those who love to listen to it. .No obviously is one of those people. From lute to piano is only a small step for a program like Kairos. We are on a mental trip as it were. Being led by the music. A very elementary piano, I could play this, I think, with behind it a choir, treated digitally. When it slowly fades away the piano takes over with something darker behind it. Still single notes played at a slow pace, making an extremely simple sounding melody, but it is of extreme beauty. And then a full band kicks in, man, I'm in heaven. Progrock in Kairos? Why not. 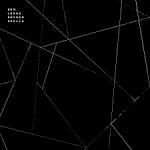 It is Ben Lukas Boysen, again also, with his 'Nocturne 3' from the album 'Spells'. And I'm not even a real prog fan, far from even, but this is very good. The change in the music is simply breathtaking. It is not the first time Boysen moved me, so it's time for a full-length review some time in the near future. The piano continues into the next choice. Busier, more forthright and present. Nick Muhly plays 'A Hudson Cycle'. The first part is fluent and fierce. Then he moves into a sequence that puzzles me. It is as if the part is too hard for him to play. Like he has to think with each chord what keys to press down. A nice effect, but also estranging. What is the impression Muhly wants to make here? 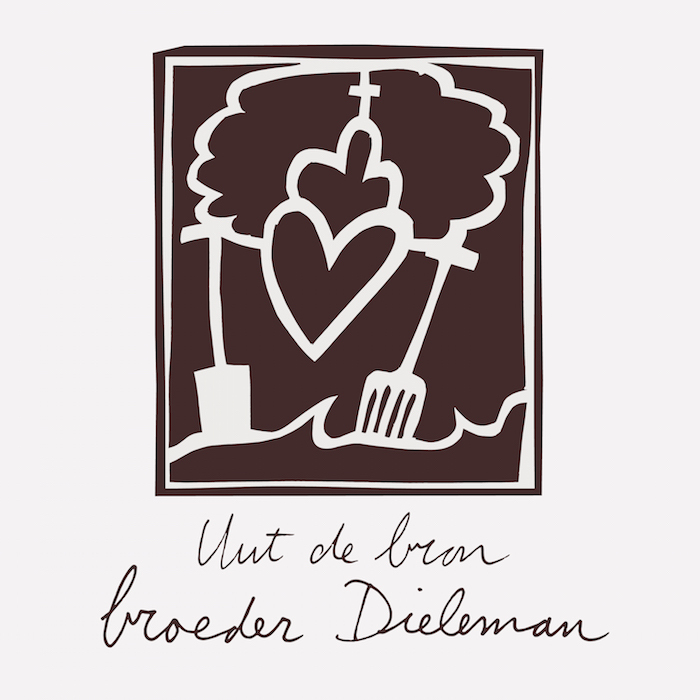 ... Broeder Dieleman. For over two years we find this Sealand bard in this program. Someone who must have made a deep impression on .No. To be fair, so he did on me. 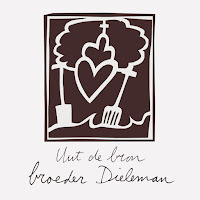 'Nahelenna' is from his last album 'Uut De Bron' (From The Source). The album was the co-number 1 record of 2015 on my list. The two moods, Dieleman and Gordon, fit, strange but true. There's a drone in the background, a banjo and bowed guitar or violin. Tonnie Dieleman chanting his lyrics of the sea, eternity and the tree of life. The more traditional sounds of violins take over from Dieleman's harsh sounding Sealand's bowed instruments. The difference could not be more extreme. .No's other hero Arvo Pärt is on. His 'Psalom' is soothing, non-disturbing almost non-evasive. As smooth as music can be. Perhaps this is the first time that I hear something from Pärt that doesn't irritate me after a few minutes. At the same time, so little happens. In that sense his composition is minimal. Just when I write this the mood changes. A threatening undercurrent is added to the composition. At first I thought we had moved to the next item, but then the violin motif returns. So something does happen after all. Yes, beauty. Inner and outward. This is not a love song? It can't possibly be. Yet it is. Pauline Oliveros sings 'A Love Song'. From how it starts, it is not the kind that Romeo won the heart of Julia with from underneath that Verona balcony. A little less romantically inclined person may be won over and even that I doubt strongly. An old organ leads the way for the wordless sounds of love that Oliveros showers over us. A Scotsman in full musical regalia underneath that balcony can only be more drastic that this ode. 'Ich Bin Das Brod Des Lebens'. Now I've heard that phrase recently being sung, but that was in 'Jesus Christ Superstar', by Ted Neely, live. Here, there's a large choir with a host of different voices, by Orpheus Vokalensemble. The voices lead me through different emotions. If in a church or cathedral, this would be a treat to be present at. We end with a song lifted from You Tube. Yes, people, nothing stops .No from presenting you what he would like you to hear. I am fairly certain that I've heard this before: Giovanni Pierluigi da Palestrina's 'Nigra Sum' and now I know where. This was a .NoWordsNeeded a while back on these pages. I even see the video in my mind's eye. Totally not my music, but I'm captured by the beauty of this composition. If Ekseption was still around today (alive), they could make this song rock, I'm sure. Rein van den Broek and Rick van der Linden really would have found their way here. For now I have to enjoy the version of Bruce Dickey, Elisabeth Reed and Hanneke van Proosdij. 00:12 Anna Backerra. Piano sonate, part 2. Album ‘We are told that we shine’. 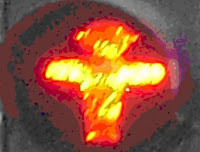 Volkoren 65. 04:58 Jóhann Jóhansson. Flight from the city. Album Orphée. Deutsche Grammophon 0289 479 6021 8. 15:34 Ben Lukas Boysen. Nocturne 3. 21:50 Nico Muhly. A Hudson Cycle. 24:54 Michael Gordon. Timber [Squarepusher Remix]. Michael Gordon / Mantra Percussion. 39:49 Arvo Pärt. Psalom. (Litany). Lithuanian Chamber Orchestra; Saulius Sondeckis, dirigent. Bum ‘Litany’. ECM NEW SERIES 1592 44 810-2. 46:23 Pauline Oliveros. A love song. Album ‘The Well And The Gentle’. hat ART 2020. 50:45 Worfram Buchenberg. Ich bin das Brot des Lebens uit ‘Vier Geistliche Gesänge’. Orpheus Vokalensemble; Gary Graden, dirigent. Album‚ Lighten mine eyes’. Carus 83.454. 55:18 Giovanni Pierluigi da Palestrina. Nigra Sum. Bruce Dickey, cornetto; Elisabeth Reed, barokcello; Hanneke van Proosdij, orgel. Voor zover bekend niet uitgebracht op cd of vinyl. Another birthday, another release. Unfortunately without the master himself. Now this release was not as spectacular as his new single in 2013, let alone the 'Blackstar' album last year. The album that landed like a bomb to be followed by a nuclear blast just two days later. Something that most likely was very well orchestrated by the master of deception himself. In fact, this release I noticed only several days after the release. To my surprise I couldn't even buy the EP in the shop. "Perhaps something for record store day", for a ridiculous price, no doubt (Wo. ), said the man behind the counter. Leaving that alone, let's turn to No Plan. The EP starts with the familiar tones of 'Lazarus', the single of 'Blackstar' with that spectacular video, where Bowie from the looks of it was actimg with his last strength. And the title song of the musical of course. What I understand is that the other three songs are rest material from the 'Blackstar' sessions that find their way to the world finally. 'Lazarus' is a spectacular song and one of the highlights of 'Blackstar'. No doubt there. As it is a song that we know for over a year now, I will leave it that and focus on the other three songs. The title song of the EP is a Bowie ballad. It faintly reminds me of his two über ballads from 'Station To Station', 'Wild Is The Wind' and 'Word On A Wing', but quality wise it's closer to his work from around 2000. So o.k., but not spectacular. Having noted that, 'No Plan' is a soothing song. "There's no traffic here, no plan", Bowie sings, preluding to where he is now? Again this aged voice, crooning away. 'No Plan' in no way reminds me of what's going on on "Blackstar'. It's a much more conventional song, that would have created a perfect point of rest on the album. So definitely on my good side. 'Killing A Little Time' is a different beast. That fierce rhythm or better drumming is back. It's as if the drummer is on this planet of his own, with all else orbiting his drums. It hardly takes any imagination to hear 'Killing A Little Time' as if it was a 'No Plan' song. Bowie is singing almost a ballad and then the song kicks in. The harsh lead guitar, the honking sax and all else, career spanning sounds move in and out of the mix. Even the piano of 'Aladdin Sane' is there for a brief moment. A leftover, sure, but one that can live in its own right. The pleasant rhythm of 'When I Met You' moves in, changing the mood of No Plan yet again. More of a regular rocker than any other song of the ten we now know from his last recording sessions. Again estranging elements are let in, after which we go back to an acoustic guitar and a nice rocking rhythm. Although, a little more in the background that drummer is still pounding away. The chorus is not the best Bowie has ever written. His imagination to come up with something different was still well in place. Sounds and his voice come in from all sides to let us know how he met "you". No Plan, as said, is only available digitally, but certainly a nice addition to 'Blackstar' and Bowie's oeuvre in general. Death inspired that much is clear. If this was it, musically, then David Bowie managed to leave this world and us, his fans, with a great salute for us all. A year down the line it is easy to conclude that 'Blackstar' is among his finest albums and one the most special records ever released. No Plan is a very nice desert. 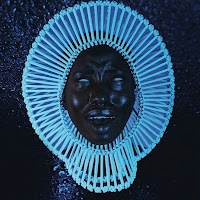 Op de platen van Childish Gambino wordt tot dusver het etiket rap geplakt en hoewel ik regelmatig mijn best doe met in brede kring geprezen rap platen, kan ik met dit genre nog steeds niet uit de voeten. Ik had "Awaken, My Love!" dus bijna terzijde geschoven, maar door alle heftige reacties die deze plaat oproept ben ik er toch naar gaan luisteren. De nieuwe plaat van het alter ego van Donald Glover wordt momenteel zowel verguisd als bejubeld, waarbij de uitersten fanatiek worden opgezocht. De een krijgt er hoofdpijn van en vindt het echt helemaal niks, de ander vindt het van de eerste tot de laatste noot fantastisch en komt superlatieven tekort. Ik schaar mezelf inmiddels onder de laatste groep. Op "Awaken, My Love!" heeft Childish Gambino de rap, in ieder geval tijdelijk, vaarwel gezegd en eert hij de funk. Het is de funk van Prince, het is de funk van Rick James, het is de funk van Sly & The Family Stone, maar het is vooral de psychedelische en zompige funk van bands als Funkadelic en Parliament; geesteskinderen van George Clinton, die in de vroege jaren 70 vanuit Detroit een ander gezicht gaf aan de funk. Het levert een eclectische plaat op, die zeker in eerste instantie wat overweldigend overkomt. Zeker bij beluistering met de koptelefoon openbaart zich echter een fantastische luistertrip, die niet alleen rijkelijk citeert uit de funk, maar ook aansluit bij 70s soul (denk aan de meesterwerken van Marvin Gaye) en bovendien de invloeden uit het heden en met name uit de neo-soul niet vergeet (met af een toe een stiekem uitstapje richting de hiphop). Het is een luistertrip die alle kanten op kan schieten. 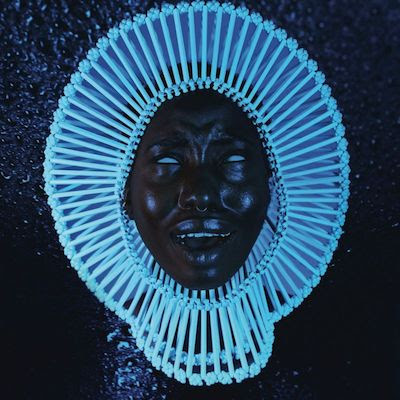 In een aantal tracks scheuren de gitaren en lijkt het er even op of Jimi Hendrix is opgestaan, in een aantal andere tracks zweeft de muziek juist alle kanten op en is er volop ruimte voor experiment, maar Childish Gambino is op "Awaken, My Love!" ook niet vies van aalgladde soul zoals die in de 80s werd gemaakt (Sexual Healing in het kwadraat). Op het grootste deel van de plaat blijft Donald Glover echter aan de goede kant van de streep en is het genieten van een prachtig eerbetoon aan funkheld George Clinton, waarbij al die andere funkhelden meteen worden meegenomen en Prince waarschijnlijk zeer tevreden toekijkt, al zal hij er van balen dat hij deze plaat niet meer heeft kunnen maken. "Awaken, My Love!" is door het van de hak op de tak springende karakter zeker niet geschikt voor iedereen, maar een ieder die zin heeft in een dampende porties 70s funk vol avontuur en passie, hoorde het dit jaar niet vaak beter dan op deze fascinerende plaat van Childish Gambino. Another band that does a three EP release before releasing the full album. 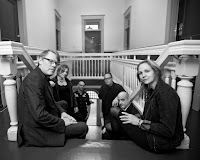 Drive Like Maria has featured on this blog with all its albums to date, although the first album 'Elmwood' was discovered better late than never by me. 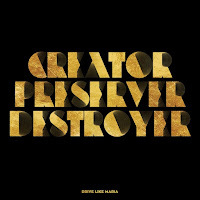 Creator Preserver Destroyer proves to be a great third addition to the band's oeuvre. The first two EPs were reviewed last summer in one go. Despite this I will treat Creator Preserver Destroyer as one whole now that the EPs are released as an album. The months past allow for a little refreshed ears as well. 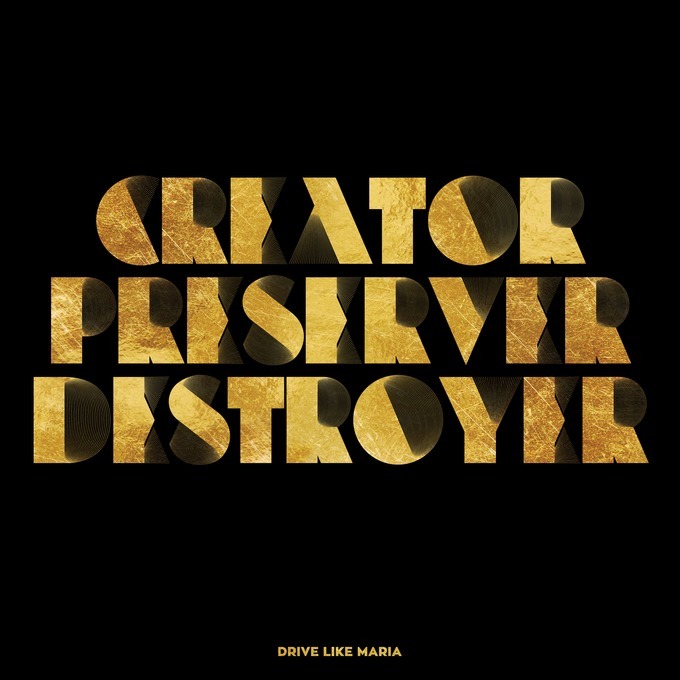 It's been over four years that Drive Like Maria released its eponymous album. Actually in the first half year of this blog both albums were reviewed. Whatever the reason for this long wait, it was worth it. The slow start of opening song 'Nighthawk' put me on the wrong leg totally. The opening is slow, muddied, sluggish. The eruption that takes the song off, is powerful, strong, rock with a capitol R. It made me realise what I had missed in the past years. Drive Like Maria is band I cherish, but sort of forgot all about over that same amount of years. The loud riffs splatter all over my ears in the second part of 'Nighthawk' and the band has me where it wants me to be: in a rocking mode. This is the basis of Creator Preserver Destroyer. Alternative rock with a hint here and there towards Queens of the Stone Age and other desert rock acts like Masters of Reality. Drive Like Maria keeps it a little more down to earth soundwise though. From there room for more relaxed or better, slower songs with a lot of inner tensions is created. 'Will We Ever' is a good example of just that. The fourth song on the album after three strong rockers. The tempo is off, the guitar plays just a few notes, the threatening mood is all in the atmospherics surrounding the basic trio of guitar, bass, drums. Like a monster about to break free from its dungeon the song comes out of my speakers. So here are already two examples of how Drive Like Maria tames the dynamics on this album. Within songs they are able to restrain and release and between songs as well. It balances Creator Preserver Destroyer in a great way. Take the rolling rhythm guitar in 'Sonny' that is allowed to go full out in the chorus. The effect is spot on to make an interesting song. That the album was long in the making comes forth from the information coming with the album. Drive Like Maria started working on the album in 2014 in its studio in Italy. Working with the three of them during the creative process spelt a new phase in the band's career. Friends came by to play or sing along here and there. Something that can be heard very obviously in the great song 'Tiny Terror'. The saxes of the Italian streetband Badabimbum, the band's neighbours in the studio. 'Tiny Terror' has a perfect build up. Talking of great rocksongs, then we have a 2017 example right here. After another up-tempo rocker, 'Saints', the tempo goes down for the opposite: 'Sinners'. Again Drive Like Maria comes up with a ballad that is the kind that crawls under the skin. De Staat comes to mind in this song, if I mentally strip away all that sets De Staat apart from most every other band that is. The two are very different bands, even if Jop van Summeren takes over the bass from Nitzan Hoffmann on some songs. In 'When The Lights Go Down' the mood really goes down. The piano of Remko Kühne leads Bjorn Awouters through this real ballad. It is also the only song that Drive Like Maria lost me. The song is sensitive, but just not interesting enough, I'm sorry to comment. The tempo goes up again and with 'Taillight' my attention is back in full. It goes back down with the atmospheric intro of 'Forget'. After that the band kicks in with a menacing rhythm ending Creator Preserver Destroyer in a grand style. Then it is all over with the option to push repeat, something I've done several times recently. Drive Like Maria is back with an album that has style and power. Nothing to complain about. The first time I heard of Thomas Miller was when he sent me the link to a single by Glaswegian singer Dee. 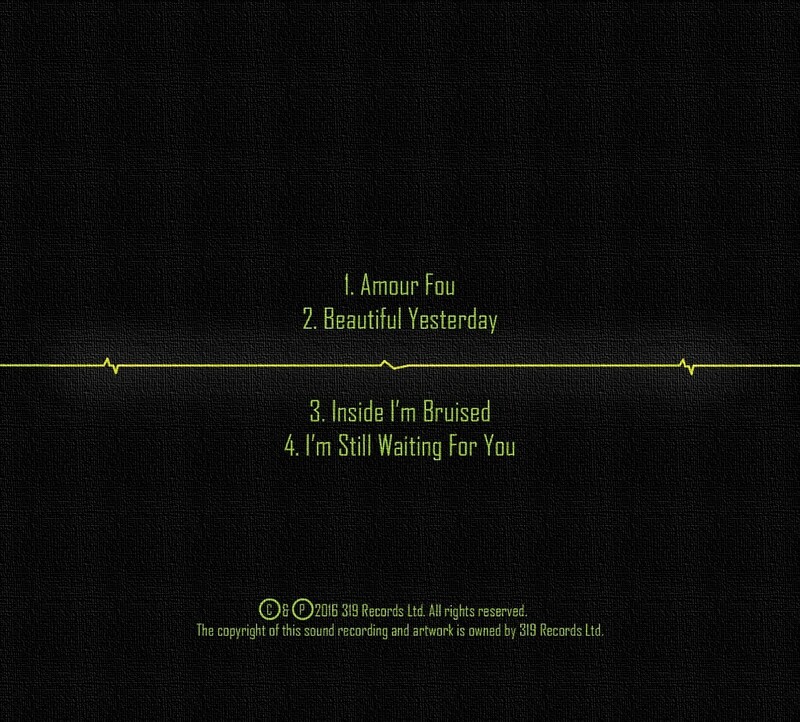 Now he returns on my musical radar with an EP of his own called Amour Fou. It was the title song that draw me to the EP initially. A mysterious song, full of atmospherics, with a faintly familiar piano sequence of notes. Like in the rest of the EP Thomas Miller works from a dance basis, but where this usually turns me off quite fast, exceptions allowed for, Miller manages to come up with an undercooled blend of dance, pop and enough hints at new wave and lighter versions of rock in the guitars to make his music fairly irresistible to me. One way or another he is able to take elements of 80s synth pop, which I pretty much abhor for over 30 years now and incorporate it into something quite attractive. Although not unique for the 10s Amour Fou is a fine hybrid of a record. As I wrote the title song is mysterious. The piano that opens it, brings and I'm still not sure, but I think Linkin Park to mind. Or is it 'Outside' by what's its name? Let me check out later and focus on Thomas Miller. Behind the piano there are rhythm atmospherics going on. The kind that really speak out when listened to on a headset. Dee, who happens to be Thomas' sister, joins on vocals. The record is a family product as both are credited for the four songs. Later on in the song a guitar is added, making the song a little darker. The song is a contradiction. On the one hand it is ultralight, like a feather in the wind, while on the other hand it is as heavy as a Buddhist monk in full Aikido swing. Intriguing that sort of thing is called. Enter the 80s with 'Beautiful Yesterday'. The light keyboard/synth sound with a delay function here and there is reminiscent of everything China Crisis, Howard Jones, etc. The digital drums add to the whole. The singing is as modern as it comes though. 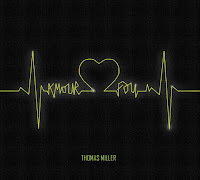 The song shows that Thomas Miller is not the best singer in the world, but he knows his limitations so well, that he delivers the song in exactly the right way. Add the voice of Dee in the backing vocals and things really work. When 'Beautiful Yesterday' receives some more dynamics by the addition of more instruments towards the end of the song, the boost lifts the song and makes it even more attractive to listen to. Dee leads the singing in the third song, 'Inside I'm Bruised', before Thomas takes over. Again mystery prevails. A softly pulsating synth drives the song forward. A guitar weaves itself around the light beat and the pulsing synth. Fascinating strings of notes are played that give the resigned sounding song a ray of light and hope. The loudest song by comparison is 'I'm Still Waiting For You'. It has a firm beat and rhythm guitar. Although the song is far from exuberant, it is certainly danceable. In a strict way that it. Again the mood is rather dark, but that does not take anything away from the hybrid dance, rock and new wave atmosphere 'I'm Still Waiting For You' has over itself. Somehow I want to start singing 'A Forest' and that can't be a bad thing. 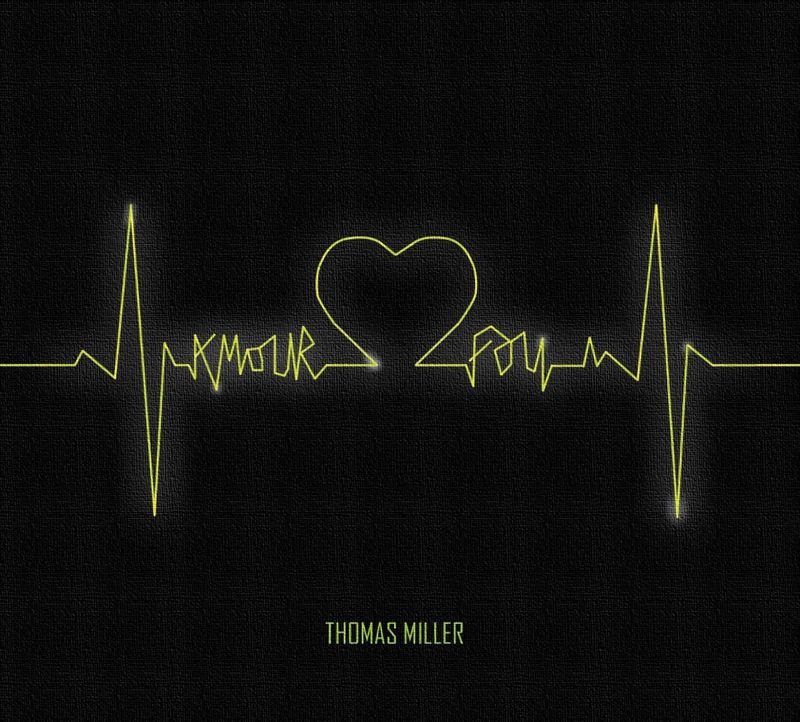 Amour Fou is the first work I've heared from Thomas Miller. I can't say that the introduction has led to a crazy love affair but I'm certainly interested to get to hear more of his music in the future. So let's be friends instead. Let me end with a compliment for the artwork by Kirsty Fraser. Really well done. The Desoto Caucus? Really never heard of. That's no reason to stop me from checking an album out. I was pleasantly surprised by the music of a band that reminded me instantly of the work of Chuck Prophet. There are notable differences, but they could be brothers of different fathers. It is not hard to predict that 4 will be the band's fourth effort. Next to releasing its own records The Desoto Caucus also toured with Howie Gelb under his band name Giant Sand. I'm not a fan of the latter, so there's no need for comparisons. 4 Opens with a drum rhythm, followed by a chugging, muted guitar. The pleasant vocal melody that follows suggests that there was an acoustic guitar involved in the composing phase after which the band started working on the song. 'Let It Glow' has a bit of mystery within it. That is added to by way of a high mixed lead guitar that seems to fade in the wind that blows over a vast, endless desert. The change to the more solid 'Powerlines' is so pleasant. The chorus is one that is quite easy to memorise. The mystique remains though. It is captured in the light, slow singing of Anders Pedersen and Nicolaj Heyman. One some what deeper, the other a higher voice. Their voices can be heard all over the album. The one following the other like a memory or ghost of things past if you like. 4 Is an album full of atmosphere. It has a subdued overtone. Like it is late at night. No one wants to go to bed yet, but the real party is over. A last drink for the road and The DeSoto Caucus is on the stereo. The first people drop off to sleep on the soothing sounds, the rest starts listening and become instant fans. 'Long Gone' makes me want to close my eyes and just listen. Take it all in and wait for that slow electric guitar eruption that comes by every once and again. The sort of music to be mesmerised by. 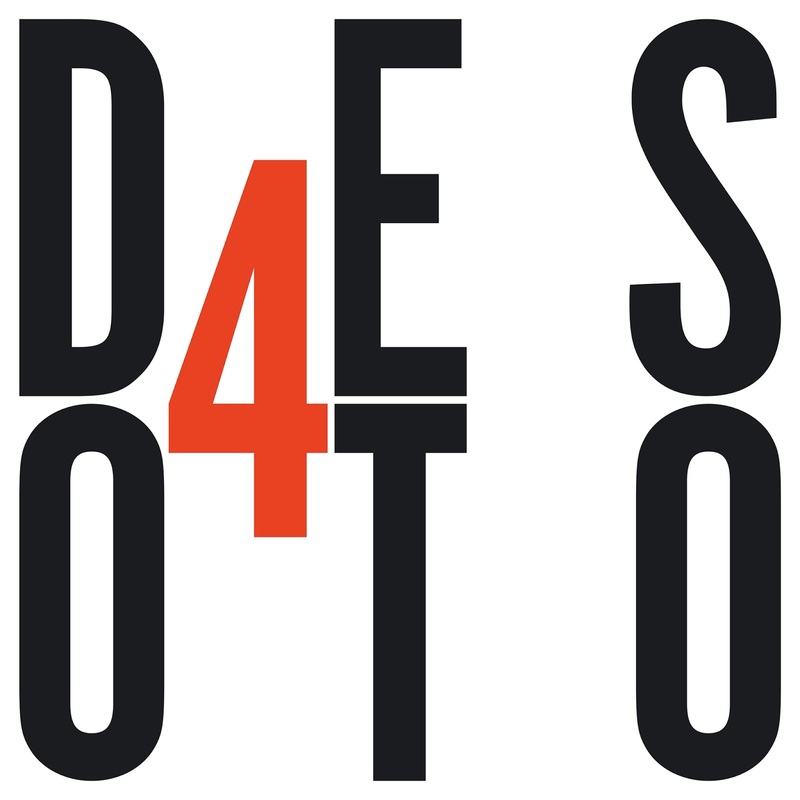 The DeSoto Caucus is from Aarhus, Denmark. Having visited the town once, too long ago, there wasn't one moment that I associated it with the Arizona desert sort of music that can be heard on 4. That may well be the Giant Sand influence. No doubt the foursome will have met Joey Burns and John Convertino as well in Tucson. 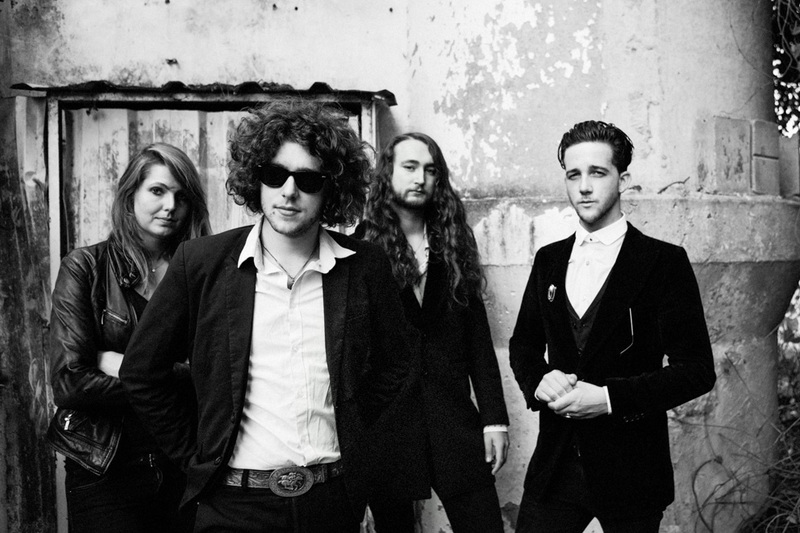 They steer well clear from the Mexican influences that they mix into their music. Anyone who expects a lot of excitement in their musical diet knows by now that 4 is not for them. If on the other hand you like to explore an album song by song and note by note there is a lot to like on 4. The music is allowed to breath, highlighting that what does happen extra, as it stands out immediately. That guitar note, piano note, it is made special by the way the band presents its little extras. 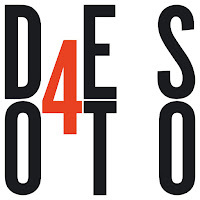 In other words, 4 is a modest album, presented with pride and confidence. Early in 2014 my girlfriend said, you better watch 'De Wereld Draait Door' as there was a band I'm sure you like. She said that twice that same week actually and both times she was right. One of the bands was The Silverfaces, the other The Future's Dust. There is another similarity. After the two EPs things went quiet. 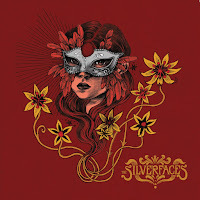 Now, three years later, the Silverfaces return with a new EP (as will A Fugitive, ex- The Future's Dust soon). So let's go and take a serious listen. What to expect three years after that EP full of youthful bluster, more a demo that a real record? I honestly did not know what to expect, but during the very first listening session I was sucked up and caught without a chance of escape. Again I'm surprised how good a product from this country can be. The Silverfaces have made a giant step towards maturity, without losing a single gram in quality. Jesse Koch (voice/guitar), Martin Scheppink (keys/backing vocals), Javier Den Leeuw (bass) and Nienke Overmars (drums) give it their all on EP II and it shows. In abundance. 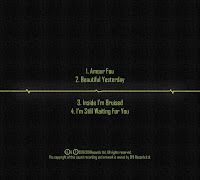 EP II holds five songs. I would have wished for a full album, but alas. Let's take a closer look at what is on offer then. The EP starts with a well-known title. Perhaps not coincidentally the opening song on The Doors' debut album. That's where all similarities end. 'Break On Through' is a ballad, the most easy going song on the EP. But then again, this song seems to have to be reigned in all of the time. The rhythm on the guitar suggests a lot more to come. And yes, the release comes in the second chorus and is reigned back in for the next verse. Masterful use of dynamics here. And then a Hammond sound kicks in for a solo and heaven is reached. I've heard albums start a whole lot less than what is going on here. The end of a song is a bit weird, but the impression of great music was laid down extremely convincing. 'Spoken Words' is louder at the start, but again here it is clear that The Silverfaces have thought a lot about how to structure its songs. Where an instrument is allowed in and when it has to leave the mix, is a choice that is made by the phrase it seems. Again a song where a lot of rock is allowed in, without ever forgetting that melody in most cases is what truly makes someone remember a song. The single of the EP is called 'The Light'. Upon hearing it for the first time it is easy to understand why. The synth that is added to the mix has a more commercial feel. There are oohs and aahs. 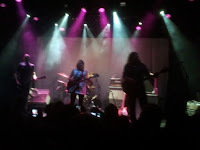 The poppy element is matched by some fierce drumming and the guitars play their role adequately. The change of pace is again so well placed, giving 'The Light' a hint at progrock, while at the same the feel of a classic rock ballad is injected, without losing that poppy element that makes this single so nice to listen to. The poppiness of 'The Light' is matched by 'When You Come Down'. This organ carried song rocks out. The fastest song on the EP in fact. The tempo makes it impossible to sit still. The melody impossible to lose. DeWolff any one? Yes, that comparison is fare game. The song is tighter though. The psychedelic part is thrown out and replaced with a hardrock element with an added pop injected melody. Another rock ballad ends it all. 'Don't Sleep In The Shade' has the quality in it to became the lighter, ah sorry, it's 2017, the cell phone song of The Silverfaces. I just love that interlude melody. Everyone from Golden Earring to The Who right up to The White Stripes have played rock ballads like this and this band of youngsters from Amsterdam just add another great one to the roster. Everything falls into its right place in this final song. So: I'm not talking Foreigner ballads here, mind. This is the real thing. So if I may suggest the true single of EP II? 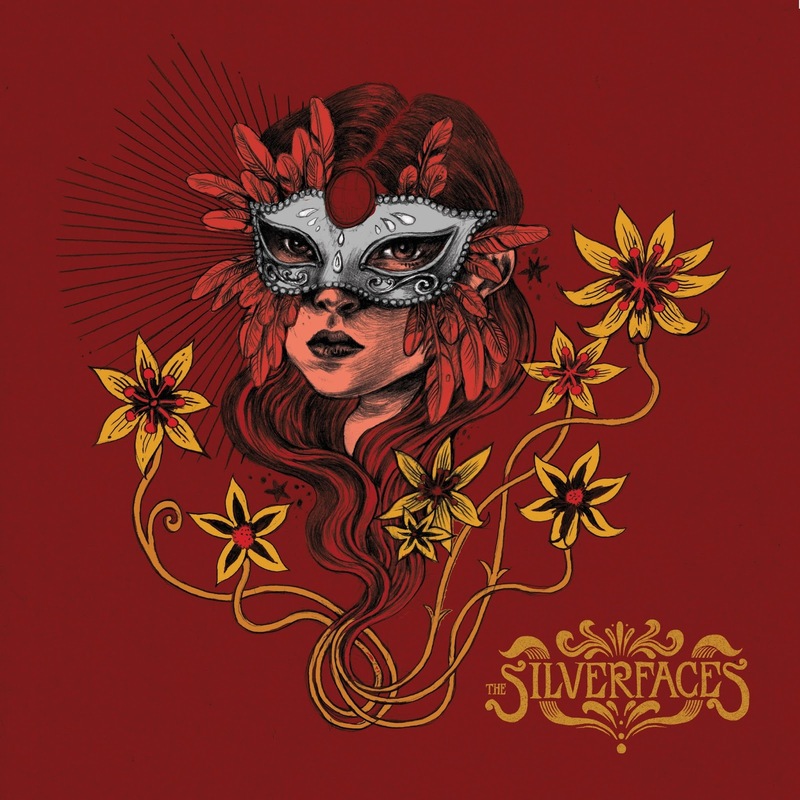 It took The Silverfaces three years to come over the shock of all the attention in 2014. I can only hope that there are some more songs in the bag already. Otherwise it may be 2020 before we get to hear more. From what I'm hearing, now for the second time, this is a band that trots some well-trodden paths, but in a highly superior way. Let the good times roll, because that breakthrough may just be around the corner. Bijna drie jaar geleden ontdekte ik bij toeval het titelloze debuut van Nedelle Torrisi, die eerder samen met Thom Moore muziek maakte als Nedelle & Thom en ook nog een aantal platen maakte als Nedelle. Het debuut onder haar volledige naam werd een paar jaar geleden opgenomen met Kenny Gilmore (Ariel Pink's Haunted Graffiti), was vervolgens een tijd zoek toen haar laptop verdween, werd medio 2013 toch nog uitgebracht zonder titel, dook vorig jaar weer op als Advice From Paradise en werd in de zomer van 2016 nogmaals opnieuw uitgebracht als Deluxe editie van Advice From Paradise. Het is nogal wat aandacht voor een plaat die slechts in zeer kleine kring is opgepikt, maar het is aandacht waarop echt helemaal niets valt af te dingen. Het debuut van Nedelle Torrisi is immers een buitengewoon fascinerende en ook nog eens wonderschone plaat. Omdat ik de plaat bijna drie jaar geleden al eens besprak en ik nog steeds achter de destijds opgeschreven woorden sta, kan ik deels volstaan met herhaling. Nedelle Torrisi maakt op Advice From Paradise muziek die zich aan de ene kant laat beluisteren als een klassieke singer-songwriter plaat, maar het is ook een singer-songwriter plaat die je nog niet eerder gehoord hebt. Zoals zo vaak wist Allmusic.com het weer prachtig te beschrijven: "Drawing from soft rock and Laurel Canyon influences, subtle electronics, and sweet indie pop, sometimes the record has the feel of Steely Dan doing trip-hop; sometimes it sounds like Carole King recording the songs she wrote in 1972 with slightly clunky but expertly operated 2013 technology". Het is allemaal waar. Nedelle Torrisi schrijft prachtige tijdloze popliedjes, maar verpakt deze vervolgens in muziek die alleen maar uit het heden kan komen. Het is betoverende muziek waarin stokoude invloeden doorklinken, maar waarin ook flink wordt geëxperimenteerd met elektronica. Het is elektronica die warm en sfeervol klinkt en die warmte kunnen we momenteel wel gebruiken. De plaat van Nedelle Torrisi is behoorlijk veelzijdig door het instrumentarium op de plaat, maar ook qua stijlen wordt er flink gevarieerd. Het ene moment gaat Nedelle Torrisi aan de haal met 70s singer-songwriter pop of zwoele soulpop, maar ook voor stekelige indiepop of moderne elektronische muziek draait de Amerikaanse singer-songwriter haar hand niet om. In instrumentaal en vocaal opzicht is het allemaal prima, maar het zijn de songs die me vooral van deze plaat doen houden. De songs van Nedelle Torrisi voelen meer dan eens aan als een warm bad, maar eigenlijk laten ze zich geen van allen goed voorspellen en wordt je steeds weer op het verkeerde been gezet. Heel af en toe moet ik zelfs aan Fiona Apple denken, maar het is wel Fiona Apple die haar depressies heeft verruild voor een roze bril. Omdat Nedelle Torrisi zich op deze plaat vooral buiten de gebaande paden begeeft duurt het even voordat je deze plaat op de juiste waarde kunt schatten, maar vervolgens is het een plaat die constant verleidt met popliedjes waarvan je alleen maar heel intens kunt houden. Alle reden dus oom ook deze nieuwe gedaante van de inmiddels al weer een paar jaar oude plaat onder de aandacht te brengen. De Deluxe editie voegt overigens prachtige, relatief sobere, alternatieve versies van de songs toe, waarin pianoklanken en de fraaie stem van Nedelle Torrisi domineren en de prachtsongs weer ander, maar minstens net zo mooi klinken. Een ‘cult classic’ noemt haar label het inmiddels. Waar, maar er zit echt veel meer in. Briljante plaat. Morgan Mecaskey's Kickstarter campaign "Home With You"
Over the past years we at WoNo Magazine have regularly updated you on new records by U.S. singer-songwriter Morgan Mecaskey. 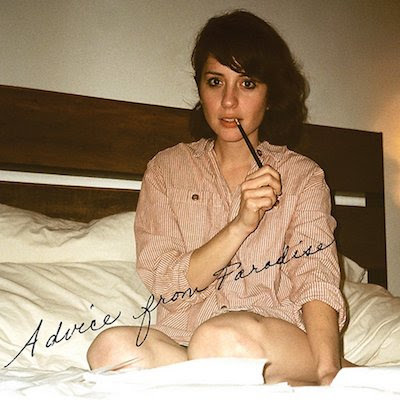 There's news from her record front: a promise of new music, we think you should learn about. Thanks to that website full of free music, Noisetrade.com, I ran into the EP 'Righteous Kind', an EP that sort of blew me away. You had the opportunity to learn more about Ms. Mecaskey through an interview that was published on these pages. Next up was a new EP 'Lover Less Wild', again filled with beautiful songs. In 2015 one of my most favourite Christmas songs ever saw the day of light. Christmas was rocked up and down as if the devil was on her tail and some more. If you like to know what I'm talking about, just search for the titles just mentioned on these pages. On Twitter I can see she's playing around the Cleveland, Ohio circuit regularly, but unfortunately I have not been in that neighbourhood off late, as in never. It is also unfortunate that it may be awhile before she comes around these climes. Come 2017 it is time for some new music. To realise this Morgan Mecaskey is asking for your help. Although we non-Americans are discriminated some what, that is, over in Europe we can't pledge for a private show at home, there is still enough to pledge for as you can see by following the link provided below. 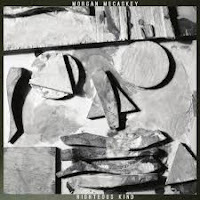 All the songs by Morgan Mecaskey I've heard so far are of a rare quality. The kind of songs that deserve to be picked up and cherished by all who love a great pop-rock-singer-songwriter song. If over here we were in a position to give an endorsement, we would. In lieu of that I kindly urge you to go to Morgan Mecaskey's Kickstarter page and pledge an amount of dollar to your taste so that she can make the record and I, as an undoubtedly pleasurable spin-off, can write a review of that record, that I can't wait to hear. Gisteren was het zondag. Een groot deel van de dag liep ik "En morgen is het weer maandag" te zingen. The Kik is geen vreemde voor dit blog. Sinds de debuutplaat 'Springlevend' is de band of het nu over de cds, optredens of een theatershow gaat, hier te vinden. Het is dus niet vreemd dat de derde plaat een recensie ontvangt. Stad En Land. Urbi et Orbi, denkt mijn katholiek opgevoede brein dan. Nu, met de pauselijke zegen heeft deze plaat weinig te maken, gelukkig. De kans was een stuk groter geweest dat u er in dat geval niets over had gelezen. Stad En Land kan een stijlbreuk worden genoemd. De beat en 60s pop van het debuut, dat een vervolg kreeg op het iets mindere '2', zijn verder weg dan ik van The Kik gewend ben. Veel meer invloeden komen voorbij, die zeker in de 60s hun oorsprong vinden. Psychedelische intermezzo's bijvoorbeeld, denk aan een vrolijke zwengel aan de muziek van The Move, maar ook Zuid-Amerikaanse of beter Herb Alpert invloeden doen voorzichtig hun intrede. Tegelijkertijd zijn The Beatles, als in de ballads, nooit heel ver weg. Wat is gebleven is de popfeel die The Kik in iedere porie heeft zitten. Samen met de koortjes die overal en nergens opduiken. De kansen op samenzang weten de bandleden overal te herkennen. Voor een fijne tegenmelodie draaien ze hun hand ook niet om. Wat is veranderd, is dat The Kik veel ingetogener speelt. Getemd door het theater? Wie zal het zeggen. Opvallend is wel dat toetsenist Paul Zoontjes zich veel meer met het schrijfproces heeft bemoeid. Misschien ligt daar een verklaring? Erg is het niet, er valt van veel schoons te genieten op Stad En Land. Het is ongetwijfeld wel van invloed op de optredens. Daarover meer eind februari. Op de plaat is het prima, want bijzonder sfeervol. "Met een lach en een traan", zoals Dave von Raven zingt in het gelijknamige nummer. Het album opent met een referentie aan stad en land. Een nummer met een vrij typische Von Raven tekst. Verlangen naar iets wat er (nu) niet is, maar wel zou kunnen zijn als. Een jazzy melodie met een bossa nova ritme (of rumba, ik ben geen expert). Dat weerhoudt Von Raven er niet van om met de tekstvoordracht flink gas te geven. Haast over laidback. Mooi gedaan, net als de 1969-70 dwarsfluit die de solo voor zijn rekening neemt. Met 'Ik Zie Je In De Stad' zet The Kik de sfeer en de intentie van Stad En Land perfect neer. Een prachtige opener. 'Maandag' is de onschuldige 60s pop ten voeten uit. Prachtige samenzang. The Monkees, The Mamas & The Papas gelardeerd met Boudewijn de Groot referenties. Een nummer dat het popgevoel van de band prachtig weergeeft. Als in het intermezzo een waltz, opnieuw, ik ben geen kenner, wordt ingezet, doet de referentie aan "For The Benefit Of Mr. Kite' zich direct gelden, ondanks dat 'Maandag' oneindig veel lichter is. Als 'Maandag' over gaat in de ode aan een 'Mooie Meid', een licht melancholiek en toch vrolijk nummer, is duidelijk dat Stad En Land met een perfect trio songs van start gaat. Eigenlijk kan het album dan niet meer stuk. Het zou betekenen dat The Kik verder alleen dramatisch slechte songs op de plaat heeft gezet. Nu, dat is niet zo. Van melancholieke ballads tot een bijna rocker, The Kik draait er zijn hand niet voor om. Ik heb enkel wat medelijden met drummer Ries Doms. De man gaat het liefst als 'Animal' te keer op zijn drumstel en zit nu toch in een behoorlijk keurslijf. De instrumental, 'Onderweg', volledig in de Herb Alpert stijl gespeeld door Benjamin Herman, is zo ongeveer het wildst wat hij mag drummen op dit album. Pas tegen het einde van de plaat, in het zwaar rockende 'Alles Ruist', mag hij echt loos gaan. Over gasten gesproken, The Amazing Stroopwafels komen langs in 'De Trap'. Met Stad En Land heeft The Kik de up-tempo beat losgelaten en is veel meer de diepte in gegaan zonder de liefde voor 60s muziek los te laten. De muziek heeft meerdere lagen gekregen, ligt ook meer in het segment van luistermuziek dan dansmuziek. Ja, ik ben benieuwd hoe dat live gaat uitpakken, maar op de plaat is Stad En Land een winnaar. Dit is genieten en niet een klein beetje ook. De Britse band Syd Arthur kan in de betere Engelse muziektijdschriften inmiddels al enkele jaren rekenen op zeer positieve recensies, maar krijgt buiten Engeland helaas nauwelijks aandacht. Met de kwaliteit van de platen van de band heeft het niets te maken, want zowel On And On uit 2012 als Sound Mirror uit 2014 waren uitstekende platen en ook het onlangs verschenen Apricity is weer een uitstekende plaat. De naam Syd Arthur is ontleend aan de roman Siddhartha van Herman Hesse, maar spreekt ook zeker bewondering uit voor de muziek van Syd Barrett en Arthur Lee (Love). Arthur koppel ik persoonlijk ook aan de gelijknamige plaat van The Kinks, want ook de psychedelische muziek van deze band heeft zeker zijn sporen nagelaten in de muziek van Syd Arthur. Hier blijft het niet bij, want de uit Canterbury afkomstige band citeert uiteraard ook uit de archieven van de zogenaamde Canterbury scene, die een aantal decennia geleden werd aangevoerd door bands als Soft Machine, Caravan, Gong en Hatfield And The North. 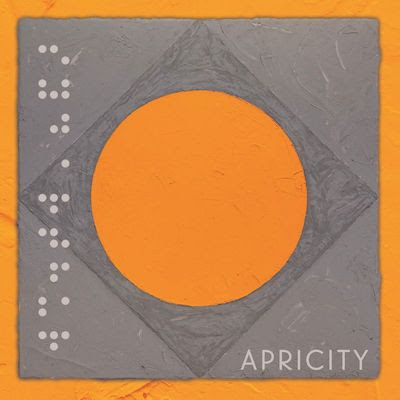 Ook op Apricity citeert Syd Arthur veelvuldig uit de muziek van een aantal decennia geleden, maar de derde plaat van de Britse band klinkt een stuk eigentijdser dan zijn voorgangers. Het levert een bijzonder geluid op, dat ik niet heel makkelijk niet in een hokje kan duwen. 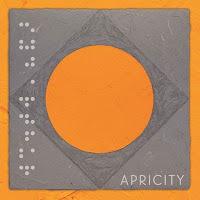 Apricity bevat flink wat invloeden uit de psychedelica uit de jaren 60 en 70, maar gooit ook lijntjes uit richting progrock, Krautrock, jazzrock en folk van weleer, maar ook zeker richting de pop, rock en neo-psychedelica zoals die momenteel worden gemaakt (en hier en daar hoor ik zelfs een voorzichtige flirt met funk en dance). De muziek van Syd Arthur is bij vlagen toegankelijk en lichtvoetig, maar kan ook kiezen voor aan de progrock ontleend experiment. Dit experiment slaat gelukkig nergens te ver door. Heel af en toe ben je de draad wel even kwijt, maar uiteindelijk staan songs met een kop en een staart centraal op Apricity. Het levert een fascinerende luistertrip op die zowel authentiek als eigentijds klinkt, waardoor je steeds heen en weer wordt geslingerd tussen een aantal decennia popmuziek. Tijdens deze luistertrip valt er heel wat te genieten. 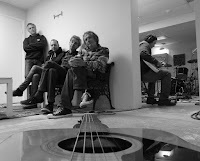 Zo is de ritmesectie onnavolgbaar maar swingend, is het gitaarwerk prachtig melodieus en zorgen met name de viool en keyboards van Raven Bush (een neef van Kate) voor prachtige uitstapjes richting de progrock en Canterbury scene, waarbij opvalt dat Syd Arthur veel warmer klinkt dan de meeste van zijn soortgenoten. In Engeland weet men de muziek van Syd Arthur inmiddels al drie platen op de juiste waarde te schatten, maar om dit pareltje kunnen we ook in Nederland niet heen. This year it will be six years since The Walkabouts released a new album and 12 for the one before that and I seriously doubt whether there is ever going to be something new by the Seattle based band. In the meantime Glitterhouse Records releases a modest box-set with the two cover albums by The Walkabouts adorned with a live album with songs from the two albums. The Walkabouts and I go back for nearly a quarter of a century. My renewed interest in new released music started in the spring of 1993 when I returned to 'Oor' and as a result was exposed to and started listening to new music. One of the writers at the time was Oene Kummer. I could follow his advice in reviews almost blind. Whatever he wrote about, I would give a chance. Whether he wrote the review for 'New West Motel' I can't remember, but he might well have. This alternative rock album was followed by an album filled with covers in the country/folk idiom. Quite to my surprise, I can add, but it did a few things. One is that I truly liked the diversity the band showed and my then wife and a lot of friends and colleagues started to like the band because of this album. We saw many a show. I think that at one point in time we were with a group of twelve going to a show. 'Satisfied Mind' is the oldest album captured here. The album that gives the title to the box set, as 'Feels Like Going Home' is one of the titles. The Walkabouts go fully country here, capturing the best the U.S. had to offer, in its own unique voice and style. At the time the band still hoped to break in the U.S., while growing a fan base in Europe. That break never came. Soon after 'Satisfied Mind' there was only a record contract in Europe. I still wonder why, as this band was so unique and had so many good songs that a breakthrough should have been as simple as 1+1. What makes 'Satisfied Mind' unique and still good 24 years later is the mix The Walkabouts made in the choice of covers. Johnny Rivers' 'River People' gets a beautiful laid back treatment through which Chris Eckman plays a sharp harmonica that adds an enormous interesting flavour to the song. Patti Smith's 'Free Money' is changed to something different. Just as urgent, yet resigned with a hint of danger: really different. On the other hand there is true country in Gene Clark's 'Polly'. Carla Torgerson sings very subdued, while a pedalsteel guitar wines away in the background. The Walkabouts is a band that never was satisfied with just the band line up. Also on 'Satisfied Mind' there is a range of instruments that goes beyond the drums-bass-keyboards-guitars set up which is the basis of the band. Anything that is needed to make the band sound more authentic is there. A blistering violin solo? Check. Pedal steel? Check. Mandolines? Check. And more. 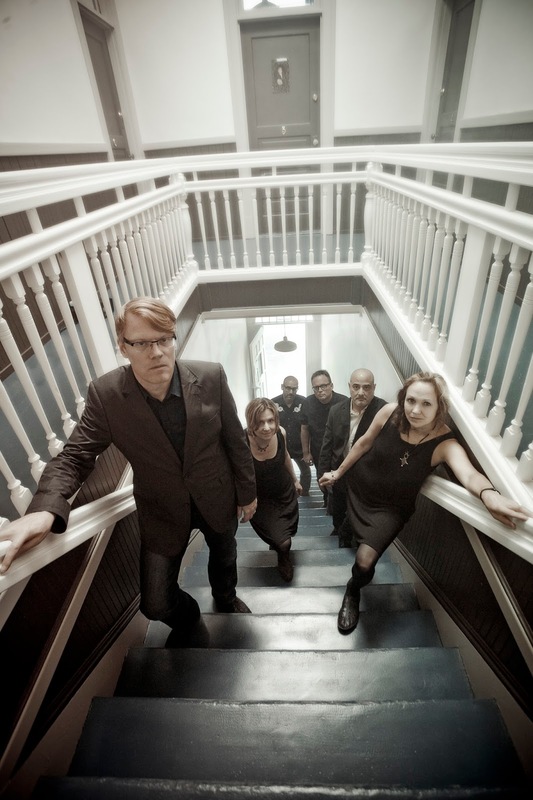 On top of that all is the beauty and the beast vocals of Carla Torgerson and Chris Eckman, at the time still a couple. Voices made for each other, giving the band a fairly unique sound. Even when The Walkabouts play other people's music. Remains to note that on this album the band touches on pure beauty and deep emotions. Just listen to 'Poor Side Of Town'. The music seems to drag behind the song, the piano, the guitar solo, the lingering organ and pedal steel. The spot on vocal delivery by Chris Eckman. And there are several more great songs like this to be found here. 'Satisfied Mind' was followed seven years later by a second cover album, 'Train Leaves At Eight'. This album was filled with European songs from over the whole continent. Songs the band had picked up through the years. By 2000 I was still a fan of the band. That simply never changed. At the time I was less happy with the new albums the band produced. Each album became more silent, less exuberant, from 1996 onwards. By the time it was 2003 I quipped that the only step left was to produce an album without music. And that is what sort of happened. The production, which had been prolific, halted. 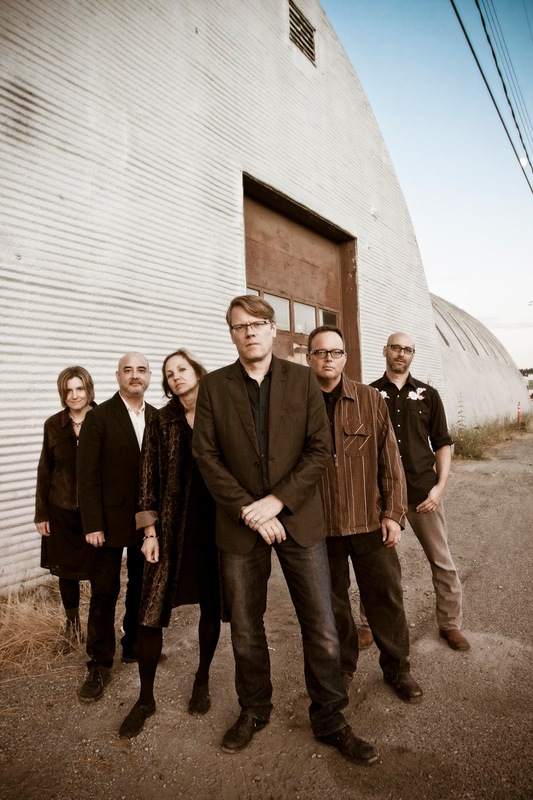 Chris Eckman moved to Slovenia, went solo, leaving the band members behind for most of the 15 years since. Back to 'Train Leaves At Eight'. The album does two things. The Walkabouts manage to capture the music without losing the European flavour of the songs nor losing its own signature sound. Listening to the album for the first time in over a decade, I notice that my ears are screwed on differently. The music is so subtle, so well placed and arranged. The Walkabouts have grown better and more sophisticated in the seven years between the two albums. Song after song I'm touched by the singing and playing. The less is more principle in 'Silenci' e.g. works 100%. An acoustic guitar, a few piano notes and atmospherics is all it takes to make Chris and Carla shine. This well-balanced mood is continued for most of the album. Having played the album several times due to this re-release I notice each time how much more I appreciate 'Train Leaves At Eight' than I did in 2000. There are so many subtle details in the songs, that are multi-layered and refined. The Walkabouts are in great form. There's and extra to this boxset. A live compilation album called 'Go To Hell, Back At Eight'. 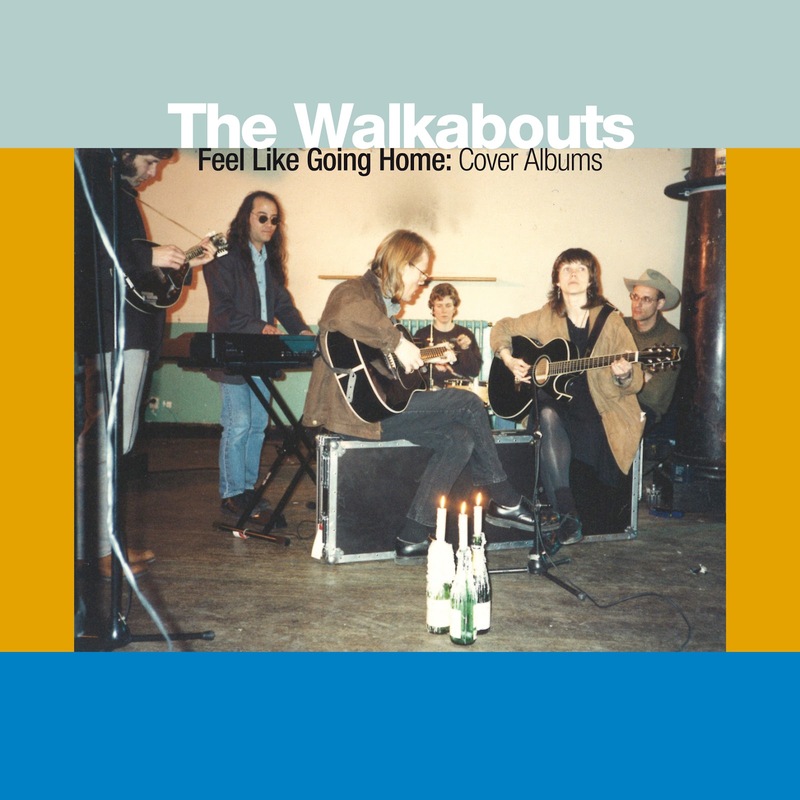 The Walkabouts released many live albums that allowed fans to have more than just the studio albums, often sold at shows. A live show from The Walkabouts always was a great experience. I can't recall how many shows I've seen, but it may be as high as 10. Including the last one early 2012 in Paradiso. The compilation registration added to this box set, is no exception to this rule. There's only one complaint. Where are the few odds and ends covers the band played through the years, some of which were released on the rarities cd 'Death Valley Days - Lost Songs And Rarities'. That would have made Feels Like Going Home complete. For the rest there's nothing to complain about. This is a great box-set by one of the most important bands of the past 25 years. Nothing more, nothing less. In 2015, I just found out, The Walkabouts disbanded. My favourite band of the 90s, there is no denying there, is no more. What is left is a legacy worth remembering and a treasure trove for many people to discover. Listening to this box set, I am reminded how good this band was and its music still is. For those who haven't before, it is time to find out for yourself. Reiger recently played the support slot of the Bettie Serveert gig in Patronaat. Unfortunately I only got to hear three songs of Reiger (when a show starts is so hard to predict. Sometimes right on time, sometimes it takes 30 or 45 minutes) which was a shame as I certainly liked what I was hearing. 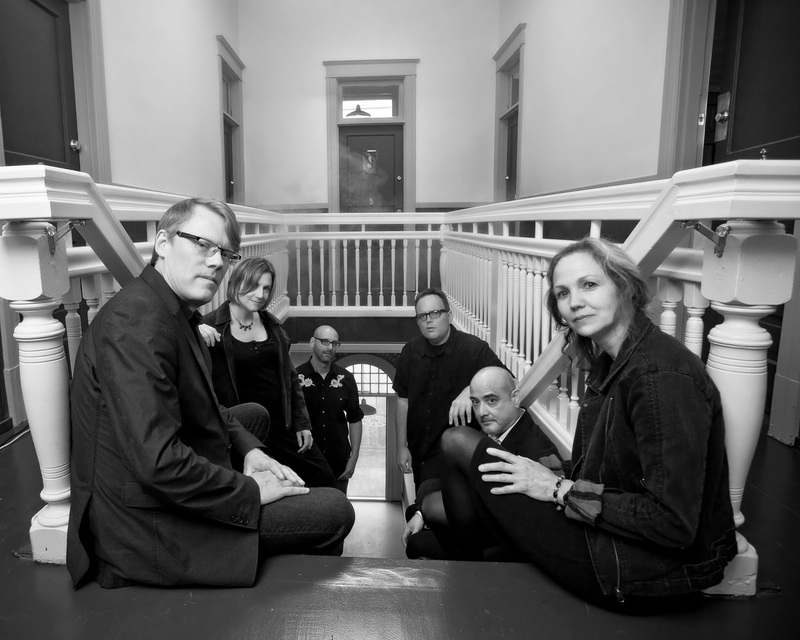 Alternative rock in the way that is popular ever since the early 90s when bands like Buffalo Tom started to draw attention. Reiger released a first EP last year, simply called EP #1. Does it deliver on the promise of the three songs I heard live? Oh, yes! What the record does not capture is the energy that was released on stage and a certain wild abandon that the band displayed. The EP captures the essence of the songs and is able to deliver a sound atmosphere. There is one major difference. Reiger on record is one person, Mathijs Peeters, who plays all with strings. Only the drumming, Otto de Jong and the studio atmospherics and things keys, played by co-producer Matthijs Kievit, are left to others. That given makes a live studio performance of a band impossible and has its effect on the whole. Mathijs Peeters used to be a member of The Gasoline Brothers. I am sure I've seen the band play at least once. As support act to The Tragically Hip in Utrecht somewhere in the 00s? Now after reading the above you may conclude that I don't like the music presented on EP #1. Far from. Reiger has laid down five tracks that are all above the average. Let's break the EP into five pieces to find out why. 'Calm Down' is the first song. It is an upper tempo song with a lot of guitars that play these little extra sustained notes that create pleasant melodies on a guitar. Yes, Buffalo Tom and the like shoot up in my mind. Bands I haven't played for ages. They've sort of come and gone. The different sounding guitar solos make the song even more interesting, a cleaner one and a dirty one for contrast. The light and the shade move around in 'Calm Down'. 'Complicated' reflects on the glam rhythms of T. Rex. At the same time Queens of the Stone Age come by including a Mick Taylor era Stones guitar motive that moves in and out of the song. Simple yet effective. The rhythm chugs forward like a steamboat on the Mississippi. It is hard not to like this song. So elementary yet it seems to have it all. This rhythm comes back in a somewhat wilder form in 'Tapes'. Here the QOTSA reference is even clearer as the rest is stripped away. The stop-start accents in the rhythm guitars is so compelling. It makes me want to move the whole time. 'Tapes' is an extremely danceable rock song. The overdubbed guitars add to the atmosphere. From little leadlines to a full blast solo. Reiger really cooks up a storm here. Idea upon idea floating in and out of the song, so I have to prick up my ears the whole time to keep up. The (vocal) melody of 'Tapes' is so fluent that QOTSA may even lose out by comparison. With 'Hollow Man' the tempo really goes down. That does not prevent a distorted guitar from erupting even before the vocals come in. This Reiger type ballad is the kind that drags its rhythm along. Slow, as if everything happens just after it is supposed to, creating an effect of laziness that really lifts the song up. A hollow man, who is not for this world, caught in music. Again many ideas on the guitar come by, adding to the atmosphere and class of 'Hollow Man'. O.k., all serious things aside. Time for some punked up rock. 'Hey Hey' puts the pedal to the metal. Before I could write this sentence it was already over. 1"25 is all it takes to sing "Hey hey, my my" followed by a, distorted, shout in frustration. The drums roll, the rest blasts, over. In short: great fun. I can't wait to hear more. A little longer: a lot of work has gone into the details of EP #1, an EP that is very varied in sound and style, yet coherent and that has paid off. Mathijs Peeters is too advanced in age to write a talent is born. There's promise in abundance though. Ik ben de naam Julia Jacklin geregeld op een aantal plekken tegen gekomen en iedere keer trok ik de conclusie dat ik maar eens heel snel moest gaan luisteren naar het debuut van de Australische singer-songwriter. Dat heb ik inmiddels gedaan en ik moet zeggen dat Julia Jacklin de hooggespannen verwachtingen met Don’t Let The Kids Win ruimschoots heeft waargemaakt. Dat is de jonge Australische singer-songwriter gelukt met songs die bol staan van de invloeden, die vervolgens zijn gecombineerd tot een bijzonder eigen geluid dat direct aanspreekt. De muziek van Julia Jacklin heeft het zwoele en verleidelijke van Mazzy Star, het rauwe en eigentijdse van singer-songwriters als Courtney Barnett, Angel Olsen en Sharon van Etten, het gevoel voor perfecte popliedjes van The Pretenders, de voorliefde voor 50s girlpop van Phil Spector, het flirterige van Blondie, het fascinerende van Lera Lynn en Lana Del Rey en het gevoel en de emotie van zeer uiteenlopende singer-songwriters uit de Amerikaanse rootsmuziek. Dat lijken misschien wat veel en bovendien deels tegenstrijdige invloeden, maar luister naar Don’t Let The Kids Win en je hoort het echt allemaal. En nog veel meer, want in ieder artikel dat ik lees over Julia Jacklin duiken weer andere namen op en echt onzinnig is het maar zelden. Julia Jacklin smeedt het allemaal aan elkaar in vrijwel onweerstaanbare popliedjes of in folky songs die je tot op het bot weten te raken. Het zijn de popliedjes die het oor genadeloos strelen, maar de muziek van de Australische singer-songwriter mag ook lekker rammelen of rauw klinken of juist uiterst ingetogen voortkabbelen, wat flink contrasteert met de uitbundige tracks waarmee de plaat opent. In muzikaal opzicht is het allemaal dik in orde, met een hoofdrol voor het heerlijk galmende of juist zeer subtiele gitaarspel, maar de meeste verleiding komt toch van de heerlijke stem van Julia Jacklin en haar goede gevoel voor melodieuze en tijdloze popliedjes en haar gave om diep te graven in uiterst intieme songs. Het zijn songs waarin ik steeds weer nieuwe dingen hoor, want als je goed luistert hoor je naast alle al genoemde invloeden ook een beetje dreampop, maar ook de zich langzaam voortslepende Appalachen folk van Gillian Welch. Don’t Let The Kids Win is een plaat waarvan je alleen maar kunt houden en dat begint al bij eerste beluistering, maar je hoort pas echt hoe goed en veelzijdig de plaat is wanneer je hem veel vaker hebt gehoord. Ella is the Dutch-Swiss artist Ella van der Woude. She releases her debut EP which she simply named after herself. Now Ella for people older than I am is often simply followed by Fitzgerald. There is not much of a hint on this EP that this association ought to be made. 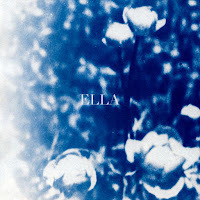 Ella is full of atmospheric music. Ella van der Woude completely relies on her voice to carry a song. 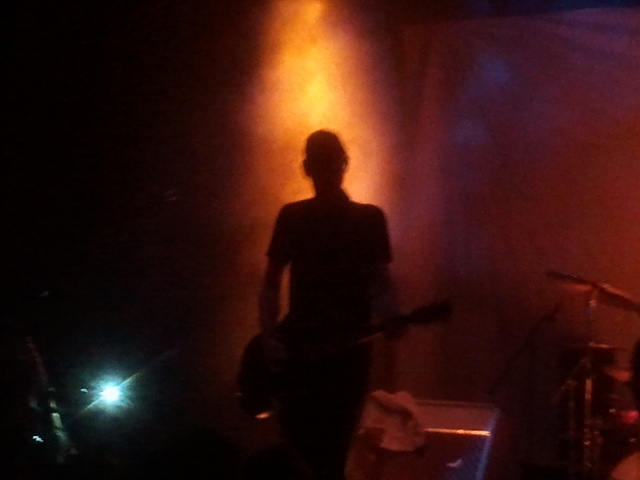 Underneath is a guitar and things atmospheric. Allow this music to and it will get you into a spell, crawl under your skin and does what music can do. Treat this music aloof, with indifferent inattentiveness and the five songs on the EP are over without one ever having noticed them. Ella demands attention. There is a reward for all that share some time with Ella. Intense beauty is showered out over you. Ella van der Woude is not totally new on the scene. 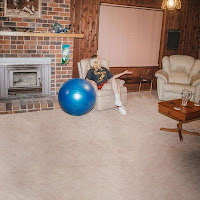 She played in Houses and played in Amber Arcades, a band that has come by on this blog and certainly will again later this year, as a touring member. After Houses broke up, she started writing music for filmscores and met with producer Stew Jackson. He started guiding her towards setting the ideas for film music into finished songs, obviously without taking anything away from the very basics Ella started to work with: a baritone guitar, a Juno synth and her voice. The result is something to be elated about. However, it wasn't the first single lifted from this EP, the enigmatically titled 'IDWTGTKY'. I had listened to this song once, somewhere last year and not classified it as special. Little was I to know that this song was to be followed by the beautiful second single 'While You Are Away'. That is when I started listening in a serious way. The mysterious sounding double tracked vocal drew me into the song. Although Ella sounds light at heart, there is a lot going on under the surface. The still waters, deep grounds proverb certainly seems applicable here. The soft voice of Ella van der Woude may have a soothing quality, it only takes a little distortion to give it a more disturbing one. Large ripples in the pond from that moment on. Ella does not contain happy music. It has a darker edge to it, besides being serious. Listening is required as I already mentioned. Different moods present themselves, even within songs. Take 'Restless'. The song has a lighter, dreamy quality, in voice and guitar, next to something that I'd call a hopeful despair and this darker side that looms over more songs on Ella. The synths looming in the background play a role here. No matter how empty the song may be by pop and rock standards, it is filled to the brim with different emotions and moods, making 'Restless' an utterly intriguing song. The surprise of the EP comes in the fourth song, 'Unknown Treasure', when drums and strings enter the music. All of a sudden Ella opens up in a totally different way. A beautiful counterpoint to all the other songs. Yes, here and there Ella reminds me of something I've heard before. Yet I'm not tempted to drop names. With Ella Ella van der Woude has created her own little spot in the universe. A little, but bright star is shining there. Time will tell how this star is going to grow. What to think of Hear The Lions Roar? I tend towards pointing you towards the artwork of the album. The somewhat childish, yet very well stylised lion on the front sort of tells a lot about the music. Somehow I have a hard time taking the music totally seriously. The fact that the Toy Dolls come to my mind while listening to Half Japanese is telling. A punk band that plays great, but through the voice and the topics being sung about hard to take seriously. Let's delve in deeper and see if this first impression is a correct one. With the accumulation of listening sessions several things start to fall into place. The psychedelic tendencies lacing the music shine harder and harder. The muddied sound lets through more and more details, that show that a lot of attention went into the details of recording (or that musicians were given a free hand to improvise details in the whole). There's no big plan behind the music. It goes where it goes without being hindered by any conventions. Hence there are songs that seem to be built around and above a chugging rhythm ('It Never Stops') and songs that take a famous chord progression and rhythm like 'Everybody needs somebody''s over which another song is played ('Of Course It Is'). In other words there is a lot to discover on Hear The Lions Roar. Until I received this record late in 2016, I had never heard of the band Half Japanese, as far as I'm aware. 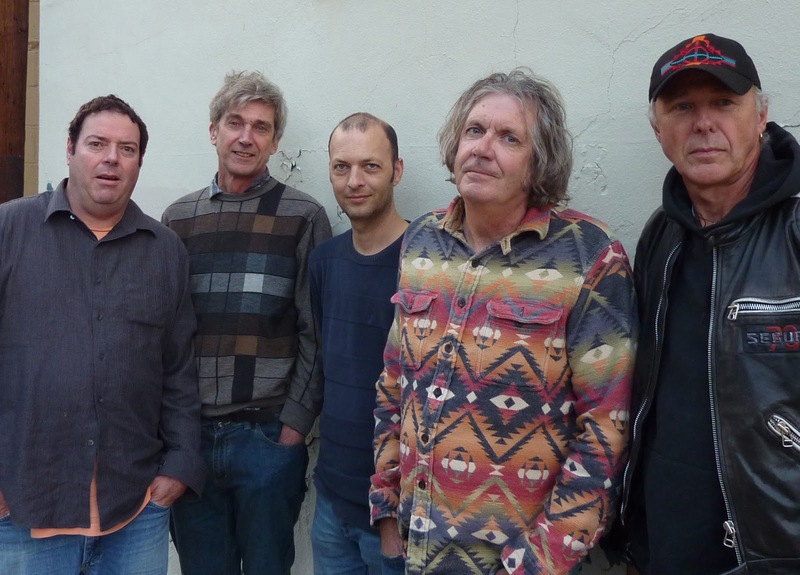 Hence my surprise when I found out that the band is around for over 40 years, having started in 1975 by the brothers Jad and David Fair. 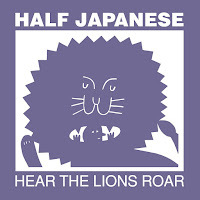 Half Japanese released its first record, the EP 'Calling All Girls' in 1977. In the 80s David Fair left the band, that Jad now leads for three decades. A rather bizarre claim to fame is that Kurt Cobain was wearing a Half Japanese t-shirt when he took his life. In 2017 the band is rather active after a long recording hiatus. 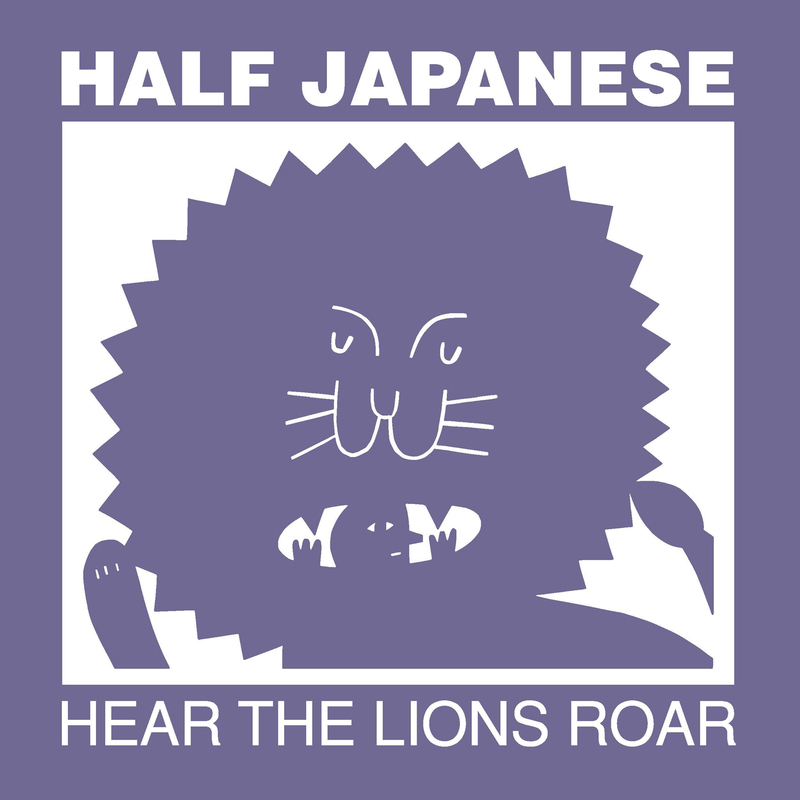 Hear The Lions Roar is the third album since 2014 to be released. The more I listen to Hear The Lions Roar the more the album grows on me. It has so many different sounds and songs that I keep being reminded to truly listen to what is going on. Of course I heard something in it from the start, otherwise I would not have invested the time. But I honestly did not know where things would go between us. The switch from the ballad 'The Preventers' to the title song is such a pleasant one. Having been surprised by a slow song of a good quality, the band goes out into a carnival fair sort of song that twirls and reaches out. When the horns chime in, the party is complete. A memorable psychedelic outing it is. The music of Half Japanese walks a thin line. 'Do It Now' has a talk/sing vocal. So I start listening to the music more intently. A fierce drum drives the song forward, with outings on the organ and the guitar which makes the song extremely lively. It is not hard to find the Elvis Costello, Joe Jackson, The Rumour, Ian Dury, The Stranglers sort of influences in this music. There's always a high sounding organ. The days the simplicity of punk was left behind, while the energy was still there. Half Japanese plays with these influences, makes it something its own and then adds the typical voice of Jad Fair. That is not the whole story. What the band also does, and here I start to repeat myself, is add something interesting in the whole of the music. Its love for this music shows in those little details that are added. No matter how murky the whole at times may sound, the mud is full of little shiny pearls that were definitely not thrown in for the swine. And that is what endeared me to Hear The Lions Roar. This is no Toy Dolls, believe me. It is only in the final song, 'Super Power', that simply goes on and on without going anywhere, that I have heard enough. By then I have no complaints left. Hear The Lions Roar has convinced me: Good record. How many times have I seen Bettie Serveert play since around the late 90s? I can't recall. Many a time, once even totally unplanned at the spur of the moment. There were several great shows among them, but this one? The band played blisteringly good. With so much power, energy, joy and good old fun, that it started to dawn on me that had this been a band of youngsters at the start of their career, no one would have been surprised. It's the lines on the faces of the band and a lot of the audience, that pushed the band enthusiastically onwards, that belied my thoughts. The evening started out with a band called Reiger ("Heron"). Unfortunately I came in a bit later to a packed Patronaat and missed out on some great indie-rock songs it seems. Three songs were all that I got to digest. 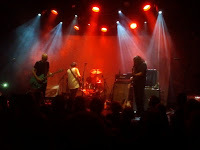 Reiger also is not a young band, 40 somethings were on stage with a younger drummer, replacing the injured drummer. Hearing the songs for the first time it is hard to really form an opinion, but from what I heard, I had the impression that Reiger is an ideal warming up band for Bettie Serveert. Some great interaction between the guitarists and songs that gripped me without any hesitation. 'EP #1' went home with me, so watch these pages if its as good as the few songs I heard. The show opened with a video of the band on route to Haarlem and behind the scenes during which Peter Visser walked on stage, picked up his favourite guitar, the one with a 'P' on it and started to play with his stomp boxes. Noises zoomed, plopped and meandered around the venue. Drummer Joppe Molenaar joins and hits this hard, fierce rhythm. Bassist Herman Bunskoeke steps on stage, straps on his guitar and joins the rhythm. When singer Carol van Dyk makes her entrance, including her bag, thank you HareD for pointing out this detail, the noise turned into a song. A lot of the songs of the latest album 'Damaged Good' came by. Bettie Serveert can be truly proud of this album in my humble opinion. The songs added to the live show that was interspersed with many a favourite and/or album track from the past. I don't even really care which songs the band plays. What I love first is the energy that always comes from the stage. A drummer who seems to give more than he has in him. His face contorted as if each single next hit could be his last. The cool of the 100 kilos bass player who is in his corner, doing his thing. Playing great lead lines or elementary supportive notes, adorned with an occasional smile. Peter Visser who is one with his guitar and stompboxes, playing like there is no tomorrow. Over this all Carol was singing great. I truly believe that Bettie Serveert's singer is still getting better. At the same time she keeps things together with her tight rhythm guitar playing. About four years ago I wrote on a show in the, now defunct, LVC in Leiden that Bettie Serveert was on fire. So what was the band this evening in Haarlem? How to describe this enormously energetic show? It must be something more than that. The smiles on stage said it all. I mostly saw the back of heads in front of me, but surely one big smile must have radiated back from the floor to the stage. Radiated? O..k., nuclear then it is. De naam King Creosote zag ik jarenlang opduiken in de betere Britse muziektijdschriften en vrijwel uitzondering in zeer lovende recensies. Pas in 2014 brachten deze lovende recensies me er toe om eens te luisteren naar de muziek van het alter ego van de Schotse muzikant Kenny Anderson en sinds de beluistering van From Scotland With Love ben ik fan en begonnen aan het ontdekken van het bijzondere oeuvre van de Schot. Onlangs verscheen een nieuwe plaat van King Creosote en wederom zijn gerenommeerde Britse muziektijdschriften als Mojo en Uncut zeer lovend. En terecht. Kenny Anderson was de afgelopen 20 jaar enorm productief en heeft een enorme stapel platen uitgebracht (in totaal meer dan 50 platen, waarvan flink wat op zelf gebrande cd’s), maar de laatste jaren is hij wat meer gefocust en heeft hij bovendien de beschikking over een wat ruimer budget. Het is te horen op Astronaut Meets Appleman dat is verschenen op het eigenzinnige Domino label en prachtig klinkt. De muziek van Kenny Anderson is geworteld in de Britse folk uit de jaren 70, maar is vervolgens aangevuld met flink wat andere invloeden, waaronder invloeden uit de Schotse volksmuziek. Iedereen die de platen van King Creosote kent weet dat Kenny Andrews prachtige verhalen kan vertellen en deze verpakt in al even prachtige songs. Het is op Astronaut Meets Appleman niet anders, maar dit keer zijn deze songs ook nog eens voorzien van bijzonder fraaie en vol klinkende arrangementen. Kenny Anderson pakt op Astronaut Meets Appleman flink uit met veel strijkers, een flink arsenaal aan andere instrumenten en hier en daar mooie koortjes met vrouwenstemmen. Het geeft zijn toch al zo bijzondere songs nog net wat meer glans. 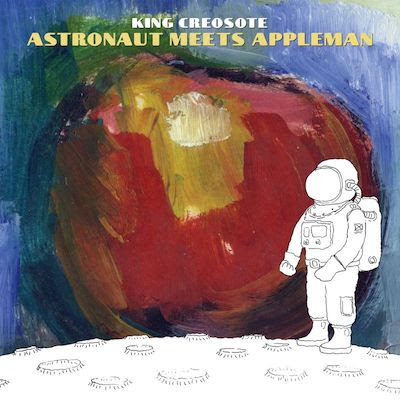 Het is genieten voor een ieder die het rijke oeuvre van de Schot ook maar enigszins kent, maar ook als Astronaut Meets Appleman de eerste kennismaking is met het werk van King Creosote overtuigt de plaat bijzonder makkelijk. De songs van Kenny Anderson sluiten aan op de rijke tradities van de folk, liggen lekker in het gehoor en laten zoveel oorstrelende dingen horen dat je al na een paar minuten in de wolken bent. Bijna een uur lang tovert Kenny Anderson het ene na het andere briljante popliedje uit de hoge hoed. Het zijn popliedjes vol zonnestralen, maar af en toe mag er ook best eens een donkere wolk voorbij trekken of een flinke bui vallen. De Britse muziekpers prijst hem wederom de hemel in en dat verdient King Creosote zo langzamerhand ook in Nederland. Prachtplaat. Punt.